How did dinosaurs become so prolific between the Triassic and Jurassic periods? Scientists believe that the end of the Triassic was one of the busiest times in the history of land vertebrates. There were all types of animals, such as crocodiles, turtles, lizard relatives, pterosaurs, therapsids, giant amphibians, the first mammals, and dinosaurs. But during a short period of time—maybe only about 5 to 10 million years—at the beginning of the Jurassic, dinosaurs began to dominate the land, filling almost every available environment. There are several theories that attempt to explain this dinosaur dominance. The first one is competition, as the dinosaurs out-competed the other animals for food. Second is opportunism: the dinosaurs took advantage of their specialized characteristics to take over territories of other animals. In particular, scientists believe a major extinction of certain therapsids (reptilian ancestors of mammals), rhynchosaurs (lizard-like reptiles), and early archosaurs (reptiles comprising dinosaurs, pterosaurs, and crocodilians) in the middle of the Triassic period opened up ecological niches that the dinosaurs then filled. Another suggestion is that the dinosaurs’ specialized anatomy also allowed them to beat out competitors. For example, they developed an erect posture with bipedal (two-footed) motion, giving them a longer stride and quickness and enabling them to catch and devour the other semi-erect reptiles. The best examples of this were the Tyrannosaurus rex and other large carnivores. These creatures could walk upright because of the way their hips were put together, giving them an edge and allowing them to free their forearms to grasp prey; this was something few other animals could do. Finally, another adaptation might have been warm-bloodedness, although this idea remains controversial. If it is true that the dinosaurs developed a form of warm-bloodedness, it would have allowed them to be more active than their cold-blooded cousins. 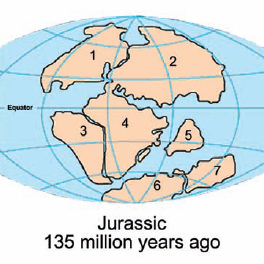 Laurasia and Gondwana began to break up during the Jurassic period. The numbers indicate what would become 1) North America, 2) Eurasia, 3) South America, 4) Africa, 5) the Indian subcontinent, 6) Antarctica, and 7) Australia.